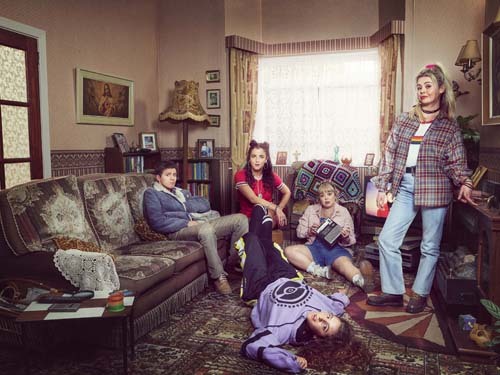 Channel 4 has announced that following a cracker second series, which came to an emotional close on Tuesday night (9 April), the award-winning hit comedy Derry Girls, has been commissioned for a third series (6×30’) by Ian Katz, Channel 4 Director of Programmes, Head of Comedy Fiona McDermott and Commissioning Editor Jack Bayles. Derry Girls is a commission for Hat Trick Productions and is a showcase of creative talent from Northern Ireland, entirely set and made locally. Derry Girls received funding support from Northern Ireland Screen. Derry Girls Series 2 launched with a consolidated audience of 3.2m viewers for episode 1, which makes it Channel 4’s biggest UK comedy launch episode for 15 years. In Northern Ireland, the S2 launch has been the most watched programme across all chances since Series 1. The second series has so far part-consolidated at 2.7m viewers (after 4 episodes). Series 1 averaged at 2.5m viewers. Happy days! Derry Girls is the creation of acclaimed writer Lisa McGee who has mined her own experiences to create a candid, one-of-a-kind, family-centred comedy. While Series One saw the gang navigating their teens in 1990’s Derry against a backdrop of The Troubles, Series Two sees them navigating their parents, parties, love interests and school against the backdrop of a precarious peace process. Northern Ireland is growing up – this gang of eejits certainly aren’t anytime soon. Derry Girls takes a warm and hilarious look at the everyday lives of ordinary people living in extraordinary times. The series follows Erin (Saoirse-Monica Jackson), her cousin Orla (Louisa Harland) and friends Clare (Nicola Coughlan), Michelle (Jamie-Lee O’Donnell) and Michelle’s tag along English cousin, aka The Wee English Fella, James (Dylan Llewellyn). The series also stars Tommy Tiernan as Erin’s long-suffering father, Tara Lynne O’Neill as Erin’s mother, Ian McElhinney as Granda Joe and Kathy Kiera Clarke as Aunt Sarah. Siobhan McSweeney also stars as Sister Michael, the straight-talking Headmistress of Lady Immaculate College, where the gang attend. Commissioned for Channel 4 by Director of Programmes Ian Katz, Head of Comedy Fiona McDermott and Commissioning Editor Jack Bayles. The series is written by Lisa McGee. Caroline Leddy (The Inbetweeners, Friday Night Dinner, London Irish), Liz Lewin (London Irish, Crashing, My Mad Fat Diary), Jimmy Mulville and Lisa McGee are Executive Producers.